MK Business News reports that LG plans to be the first company to launch a full-sized, OLED-based television. 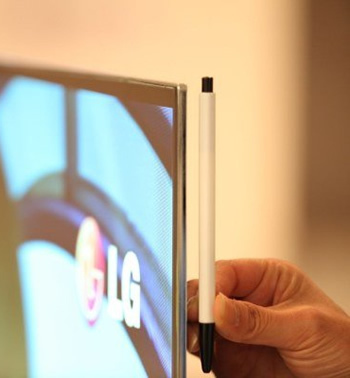 The ultra-thin 55-inch television is expected to ship as early as May. Of course, the only thing more impressive than the TV itself will be its asking price of about $7,928.91. LG actually showed off a 55-inch OLED TV at CES a few months ago. If the one released in May is anything like the demo unit we saw at CES, consumers can expect something that is less than a half-centimeter thick, under 17 pounds and 3D ready. LG had also talked about adding a number of futuristic features, including 3D motion and voice gesture controls. However, LG has yet to comment on what consumers should expect from the new television. OLED (organic light-emitting diode) is superior to traditional LCD technologies in a number of ways and has been long considered the (almost) perfect mate for televisions. In other words, OLED and TVs go together like peanut butter and chocolate. For starters, such screens don't require a backlight because each pixel provides its own light source. As a direct result, OLED displays can be super thin, provide better contrast, deeper blacks, better viewing angles and do it all with considerably less power (with the right design, of course). OLED also provides faster response times by orders of magnitude, eliminating any ghosting or even appreciable latency. Where large LCD panels typically have response times slower than 20ms, OLED panels exhibit response times of less than 0.01ms.